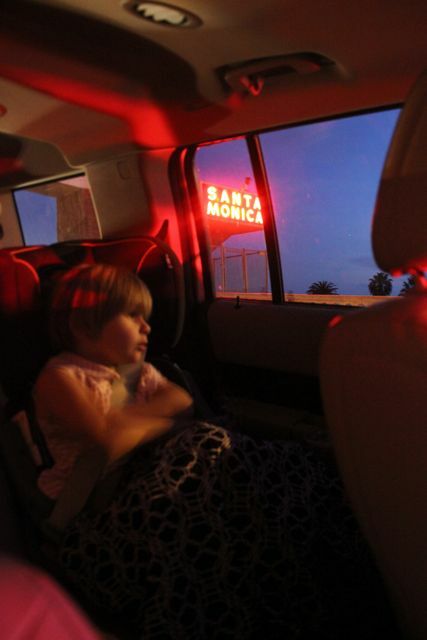 Yesterday… in the car… on the way home…sitting stopped in traffic on the ramp headed down to PCH from Ocean Avenue…I turned to talk to P and saw the “Santa Monica” sign lit up and perfectly framing P’s head in the window! I quickly grabbed the camera and then tried to get into position fast before the light changed. Problem was my giant belly! It didn’t let me turn in the right position and I didn’t want to make a great fuss. I loved P’s expression exactly where she was. It’s her usual expression after a west side trip: tired from a long day and somewhat bored knowing we have a 40minute drive before being home, mixed with a hint of curiosity about what she could spot out in the water. Sometime its dolphins, or surfers, or nothing.